BRAMPTON, Ont. 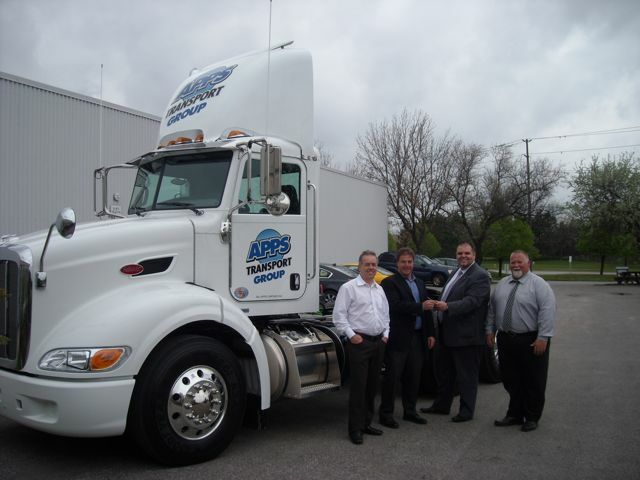 -- Apps Transport Group has taken delivery of the first of 17 new Peterbilt 386s the company has ordered. Pictured (L-R): Brent Byers and Rob McDonald of Apps Transport Group with Mark Frias and Dave Farrington, both from Peterbilt Ontario Truck Centres. BRAMPTON, Ont. — Apps Transport Group has taken delivery of the first of 17 new Peterbilt 386s the company has ordered. It’s a significant investment for Apps, as the order represents about one-third of its entire fleet and the switch to a premium truck is somewhat uncommon for a city cartage fleet. Rob McDonald, president of Apps, told Trucknews.com the company was unhappy with how its EPA07 generation vehicles were performing and decided to start with a clean slate when transitioning to EPA2010 technology with selective catalytic reduction (SCR). Local dealer Peterbilt Ontario Truck Centres, “put by far the best package together,” McDonald said. The 386s, with 450-hp Paccar MX engines and automated transmissions are a heavier-spec’ than others within the fleet and will be given to dedicated drivers handling heavier loads. Apps plans to keep the trucks for seven years – at which time they’ll have about 500,000-600,000 kilometres on them – and then determine whether to trade them in or continue running them, based on the condition they’re in. It has spec’d features such as automatic shutdown to reduce idling and keep the hours on the engine as low as possible. “Our target is around seven years, then it’s decision time,” McDonald said of the projected lifecycle. However, he said the purchase was made for practical reasons, in an effort to drive down repair and maintenance costs, and not to project any particular image to drivers or customers. A second round of premium truck orders is planned for later this year, if the economy holds up and the trucks perform as expected, McDonald said.